Warsaw and Krakow: A quick insight into Poland. — Omni. Covered in snow, full of history and spotted with charming old buildings - welcome to Poland! I went during the middle of March for a few days between the two cities, with my two, trusty travel buddies, Ali and Mina, and this is a quick insight into the places visited and the must-do quick-bits of each city. 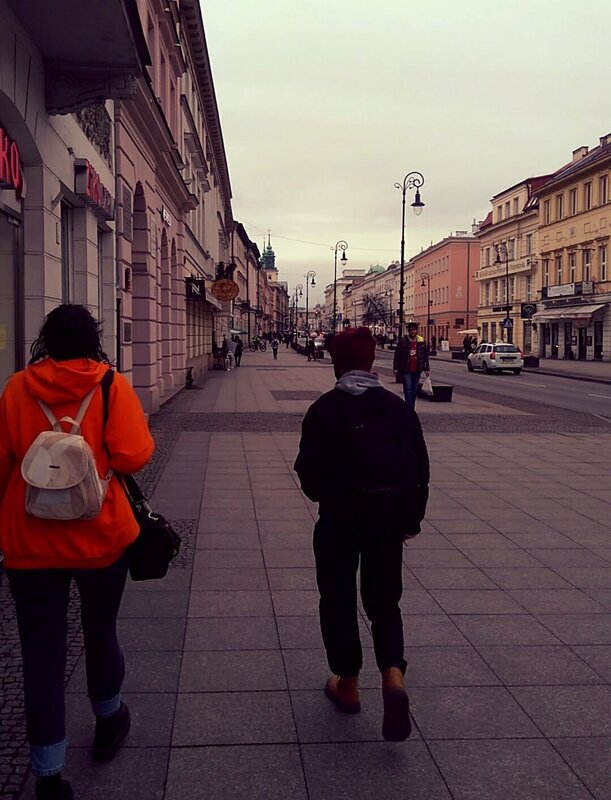 Warsaw: Cheap tattoos and second-hand stores, amazing views and pierogi! First arriving and before checking in, we wandered around to try some authentic Polish food and to get some tattoos! My friends both got tattoos from this place - both small and under an hour. We initially found it strange that there wasn't any confirmation contract, checking that they were over 18, not pregnant etc. but this was a last minute walk-in and we assumed the Polish tattoo laws were perhaps a bit laxer. However, this is why they were so cheap! They were approximately 200-300 zloty, about 50-60 euros, compared to the high, well over 100 euro Berlin tattoo studios! Despite no contract, the tattoos ended up being good quality, exactly what my friends wanted and done accurately and cleanly. Mushroom pierogi with sour cream! At the recommendation of the tattoo artist for the 'best pierogi', we visited this restaurant relatively close to the studio. It turned out it is a semi-chain restaurant, with a few restaurants in Warsaw and some in Krakow. For those of you who don't know, pierogi are dumplings with savoury or sweet fillings - I chose mushroom, Ali chose spinach and Mina chose bacon with options of sour cream, bacon gravy, and others. They're seriously delightful, surprisingly filling and worth a try on a visit! Finally made it to the Hostel! We stayed at the Press Hostel, which was small and offered a shared bathroom, kitchen, and a lounge area, as well as a locker and a bed within a 10 bunk-bedded bedroom. It had clean sheets and a comfy bed and was a simple and cheap enough place. About a twenty-minute tram ride to the Old Town and a bit longer for the further parts of the city. After a nap, we headed out for a few drinks in the Old Town - which itself is probably the most beautiful part of the city we saw, with gorgeous old buildings. This is a bar surrounded with castle-like buildings and is an adorable nook that had live, authentic Polish music playing throughout our short stay there. We ate there - where I first learned a bit of the brutality of being a vegetarian in Poland! I had a tomato soup that was lovely but ordered the second, and only other, vegetarian option - potato dumplings - but even they came out smothered in bacon! Although my friends enjoyed it, Ali had a really fresh chicken salad and Mina got a bacon and mushroom tagliatelle which they both enjoyed. My favourite though.... cheap, cheap vodka. Shots that were well over the usual double dosage were about a euro and we definitely had a good night. We ended up wondering to another bar and strolling around the Old Town but exhausted from the 9-hour journey through the night so we got some sleep! Oh, and the second realisation of being a vegetarian in Poland: trying to find drunk food. We strolled around a gas station with nothing up until a McDonalds. I paid more for a "vegetarian burger" than Mina for two beef burgers, to open up a cold bun with cold cheese, two lettuce leaves, and a tomato slice. A laugh for everyone except my stomach. We went here in the morning, exceedingly hungover and in need of some coffee and breakfast! It was relatively close to our hostel and the snow had been falling lightly until now, where it had started picking up! We had some nice coffee and good espresso so it was reviving to the soul! We travelled on a tram for about 45 minutes to an hour, over the river to the other side of Warsaw, to visit the Neon Museum. It had old neon artefacts and talked about the importance and development of neon during the Cold War era in Poland. There were some cool photos to take but the actual exhibition wasn't that large and took about 20 minutes to get around! We then headed back to the Old Town, and got our holy on! I'm not religious but I can't help but love how pretty it was, and Mina was able to light a candle amongst all the marble and gold. 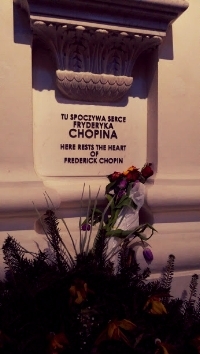 We went to go see Chopin's heart, which was encased in cognac and sneaked back into Warsaw by his sister after his death. Unfortunately, we couldn't see the real heart (we are a gruesome lot) but the memorial was there and still covered in fresh flowers, the church was beautiful, so still entirely worth seeing... as well as getting out of the deep snow gathering outside! This is just one of the thrift shop chains popular in Warsaw. They had some cute items and was a bit like the smaller versions of Humana in Berlin and Mina picked up some new jumpers (which was necessary - there was a foot of snow and we'd been wandering around cold!). Despite the now quite stormy weather and the never-ending snow, we ventured into the Palace of Culture and Science to go see some breath-taking views of the city in the snow. It was slippery and not really supervised, which could have ended badly in another situation, but was about 20 zloty entry and stunning views of every angle of the city. As we were exhausted and freezing, we headed back for some takeaway pizza, relaxing and warming up back at the hostel. As well as some packing up for Krakow the next morning! Krakow: Cool stories of dragons, mirror mazes, and vegan eateries! We took a FlexBus to Krakow which took a total of 5 hours, and poor Ali had to endure sitting next to a bloke absolutely smashed at 11am. We managed to get to the hostel very quickly as it was so central. This hostel seemed a lot more homely than the other, had options of cereal, tea, and coffee, was very open and the receptionist was so lovely and welcoming. There was still 10 beds, but had more people of varied ages and made it a very friendly and comfortable environment to be in. Again, there was a shared kitchen, bathroom and living space, as well as your own individual lockers for personal items. We had been surviving off snacks all day on the bus and were hungry. We found this recommendation in a 'Cool Guide to Krakow' leaflet and were not disappointed. 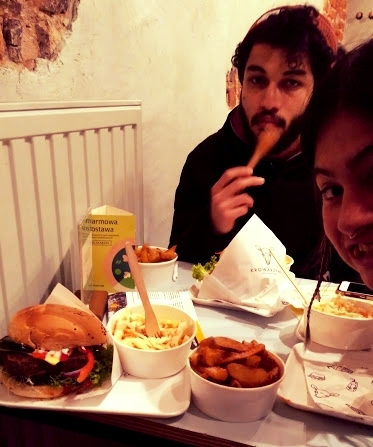 Mina and Ali had chickpea burgers and I had a Tempeh burger, they all came with chips and vegan coleslaw, as well as vegan cheese and salad toppings that filled us up straight away! It was quite cheap too, the whole thing was about 6 or 7 euros! Open up until 11pm, we visited the Mirror Maze for relatively cheap. It was so worth the visit and we had loads of fun as well as running into a few mirrors and playing hide-and-seek which could be sometimes scary when a multitude of the same person look like they're coming for you! Definitely a highlight of the trip and so, so worth it! A panorama we took in the labyrinth- spooky! We decided after to get a bit drunk, as it was St Patrick's Day! We went to Cybermachina Game Pub, where we were able to get our hands on some green beer, played Cards Against Humanity which was lying out, and watched some people ace Guitar Hero and other games around the pub. It had a huge collection of board games too, as well as just game-themed memorabilia around the pub. We went on to a German pub where we finished off our night with some Jagermeister before heading back to the hostel for more drinks, some sleep, and shelter from the ever-going snow! The next morning, our last day in Poland and a Sunday (which, unfortunately like Germany means the majority of shops are closed!) and we had a windy, stormy, snowy day again! weet Potato Brownie from Cakester. We went here for a delicious scrambled egg breakfast with various veggie and meat options for toppings! It was such a cute place with low ceilings and cosy atmosphere. We'd been trying to get into the full Milkbar across the street, but don't regret our second option! 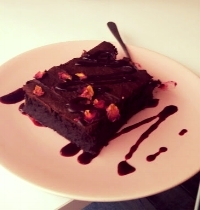 We tried some vegan oreo cheesecake and vegan, sweet potato brownies to finish and get us full up! 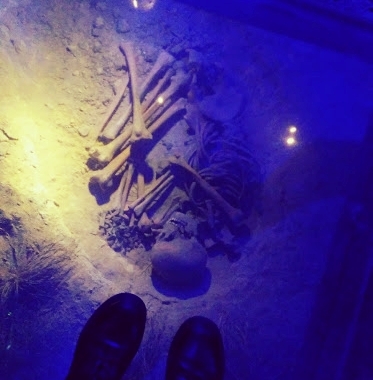 This was a creepy, semi-holographic museum right under the main square of the old town that looked at some of the medieval artefacts around the city, as well as some video rooms that showed the entirety of Krakow's history till today. My highlight was a small room with an automated, semi-puppeteered performance of the story of the dragon. The entire museum was a network, and some pieces were just old rocks so we moved through that area quickly, but otherwise well worth a see! We ventured up in the snow to the castle and cathedral, where outside the big doors is some (apparently) authentic dragon bones from the original folklore! There is a cave that tourists can explore in summer, but unfortunately, we caught it at a time when it was closed. There was a statue of a dragon, that apparently blew fire but it must have been as cold as us in the weather as we headed onward to try and hide out the snow! Our last night and we were trying to splurge our zloty a bit! It was a really posh restaurant by the main square and although between us we had 2 pasta dishes, 1 risotto dish, 1 big salad and a massive pizza, it cost us under 15 euro each! The food was so good and such great quality, well worth it for our last evening! After buying some souvenirs, cheesy T-shirts, and cute dragon toys, we left Poland back to Berlin! It was such a short, but unique and special insight into this very special, story-filled country and we all look forward to when we can next go so we can visit that dragon cave and get more cheap alcohol!